We are responding to last week’s Harvard Crimson editorial calling for Harvard College to create a bridge program for first generation and low-income students. The proposal for a summer bridge program stems from real concerns, and as the Dean of Harvard College and the Dean of Freshmen we can state unequivocally that the College is committed to supporting students from a variety of backgrounds. To that end, while the proposed program certainly has merit, we believe that an opt-in, three-day pre-matriculation program would be too narrowly focused to address the complex needs of these students. Our decision not to pursue an early program at this time reflects our informed judgment that a holistic post-matriculation approach is better suited to address the multiple challenges many of these students face in transitioning to life at Harvard. Our decision is rooted in our commitment to creating an inclusive campus where students of all backgrounds can thrive, and is informed by discussions and data that suggest that many of the concerns expressed by first generation and low-income students can be addressed effectively through post-matriculation academic support initiatives that lead to deeper and more broad-based change at the College. Research conducted by the College’s institutional research team has guided our approach. They have compiled and analyzed Harvard student data on high school experiences, academic preparation, and academic performance, as well as qualitative reports of student experiences that suggests that sustained support in the early college years would help students attain their academic goals. First, we need to do a better job of helping students access the many resources available to support them. First-year students regularly report to us that they “don’t know what they don’t know” until they have had direct experience with classes and with their peers. With this in mind, the College is creating a single point of contact in the Freshman Dean’s Office who understands the first-year experience and can help students traverse the numerous resources available to them. This person will also work with others at the College to improve our resources. In the same vein, the Advising Programs Office and FDO co-sponsored a Wintersession program for freshmen to reflect on their fall semester, familiarize themselves with the College’s academic and support resources, and plan for their spring semester. With a semester of experience at Harvard, students are in a better position to understand their academic, social, and personal needs. We plan to further support this Wintersession transition experience by opening it to more students. Second, we must continue to increase academic support, especially in the foundational areas of writing and mathematics. In recent years, we have increased academic support through our tutoring programs. This year, the Harvard College Writing Program introduced a new curriculum for Expos 10 that more responsively helps students learn and practice the fundamental steps in academic writing. 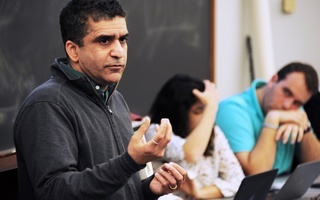 The Mathematics Department has also piloted the Emerging Scholars Program, offering students the opportunity to work in a personalized classroom setting alongside math faculty to develop key problem solving skills. Third, we are working to shift Harvard College’s dominant culture from one that is experienced as exclusive to one that feels inclusive and welcoming. The FDO and APO work with students to help make the transition from home and high school to the Harvard community by matching first generation and low-income students to a network of academic, residential, and peer advisors who are providing integrated layers of support during this transition. Mather House piloted a First Gen specialty tutor this year, and other Houses are considering similar positions. Working with the First Generation Student Union, members of the Bureau of Study Counsel have been building an informal network of faculty members who were first generation students themselves to work with students. The BSC also produced a wonderful compilation of first generation student stories for StoryCorps. Ongoing student input is essential to the success of our work to create an environment in which all of our students thrive. Finally, we are reviewing existing programs, including how we provide greater financial access to existing pre-orientation programs which create a sense of connection between first-year and upper-class students. Recent initiatives include funding for meal stipends for low-income students who are on campus during spring and winter breaks when dining halls are closed, an expanded Host Family Program, financial support to the Ivy+ First Gen conference, and funding to support expanded programming through the Office of Equity, Diversity, and Inclusion and the Harvard Foundation. We continue to work to identify sustainable resources to support new programs and strengthen existing ones. The work we have done thus far is not a panacea for every challenge first generation and low-income students face. We understand that our students’ needs will continue to evolve, and we are committed to evolving with them. Certainly, we have more work to do—work that will be informed by our mission and educational philosophy, student input and feedback, and by the best available data to identify solutions that make the biggest impact for our students. 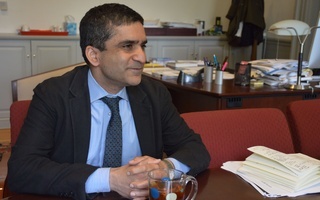 Rakesh Khurana is the Danoff Dean of Harvard College, the Marvin Bower Professor of Leadership Development at Harvard Business School, Professor of Sociology, and Co-Faculty Dean of Cabot House. Thomas A. Dingman ’67 is the Dean of Freshmen and a member of the Faculty of Arts and Sciences. Harvard has made an incredible effort to accept students from a range of backgrounds, especially those who have had more challenging paths to this point―to abandon them once they arrive is hypocritical, irresponsible, and disrespectful. We appreciate Dean Khurana and Dean Dingman’s commitment to providing resources for post-matriculation support. But we also hope that the bridge program is not forgotten and the dialogue continues, especially so that that pre-matriculation resources may be expanded in the future.